See our Contact page for our address, phone number, e-mail information, and a map. ​It's a good question to ask, and we think we have some pretty good answers, here. 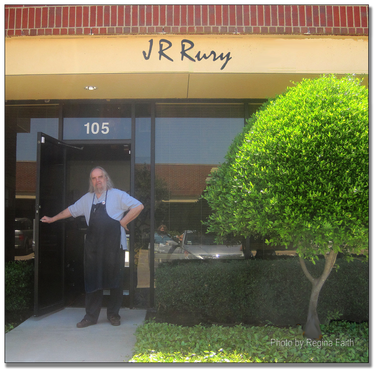 Jay R. Rury Violins, ﻿﻿﻿﻿﻿LLC﻿﻿﻿﻿﻿, is an owner-operated stringed-instrument sales and repair business in Richardson, Texas, serving Dallas/Fort Worth/Denton and the surrounding area. Jay has worked on area musicians' instruments since 1975, at first in other professional shops. We opened our doors in 1985. We offer student, step-up, and professional violins, violas, cellos, (and sometimes a double bass), bows, instrument repair, and restoration, bow rehairing, consignment sales, appraisals, and photographic documentation of your violin-family instrument. We have discounted prices on the instruments, bows, cases, strings, parts, and accessories you need. Our professional repair and restoration services are backed by our guarantee; see﻿ that page﻿ for more information. The musicians in your life will love getting our gift cards. They never expire and are always appreciated. Tuesday - Friday: 11:30 a.m.-5:30 p.m.
We've added information about five of our European handmade violins that we think you'll really like, including a Fantoni (Italian), a French violin labeled "J.B. Vuillaume," a Maciej Lacek (Polish), a Schnabl, and a Wilhelm Berthold (both German).